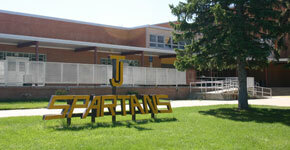 Thomas Jefferson High School founded in 1960. Learn. Challenge. Lead. Thomas Jefferson High School is a classic high school experience with a sharp focus on college and career readiness plus an award-winning communications and technology program. It has always been our mission to enhance students’ academic experiences through unique opportunities for growth, creativity and success. Providing opportunities for students regardless of ability or background, TJ serves to promote excellence in education and enrichment for all. TJ’s school colors, brown and gold, echo the original Broncos colors from their same founding year of 1960, and reflect the school’s pride and state history. TJ’s athletic teams have won numerous district and state championships, and our athletes excel in both sports and academics. The school’s many clubs and activities, whether academic or elective, are very accomplished and have won numerous competitions over the decades. The award-winning TJ Journal was one of the first online student newspapers. Ahead of its time, the TJ Journal evolved to become TJ’s website for several years. Today, this website continues the tradition of excellence in student journalism featuring TJ Journal journalists and photographers as well as Spartan Edition writers, producers and videographers throughout. TJ offers many Advanced Placement (AP) and honors classes, ACT study sessions, and concurrent enrollment courses in order to prepare students for postsecondary education and beyond. The award-winning Center for Communication Technology program (CCT), started in 1994, features classes in many branches of communications and technology. The program is renowned throughout Colorado for its success in helping students to find new passions and gain experience in communications, broadcasting, robotics, and engineering. TJ has produced countless talented alumni including professional athletes Derrick Martin and Daniel Graham, media personalities Chris Vanderveen and Dominic Garcia, Denver City Councilwoman Kendra Black, and the Editor-in-Chief of the Harvard Crimson Newspaper, Malcom Glenn, just to name a few.